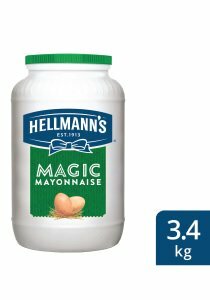 Hellmann's Magic Mayonnaise is a great dressing base with strong binding functionality perfect for your salads and dips. 12 Months closed shelf life and 4 weeks open shelf life. Ambient (Store in a cool and dry place), Max 25°C. Use Hellmann's Magic Mayonnaise on your potato salad and see great coating of the vegetables.